With many existing compilations of awards and honours conferred on Mawlana Hazar Imam (as His Highness the Aga Khan is known to his followers) one may wonder the need for yet one more. Existing lists enumerate his awards by various categories (decorations, honorary doctorates, and so forth), with some details from the citation as to why an honour was accorded. For me, the dozens of photos in the recent series here on simerg.com made it the most interesting compilation. Although these compilations, both mine and others, can never do justice to the significance of the honours Mawlana Hazar Imam has received for his life’s work, hopefully this graphic will add one more step towards that impossible objective. 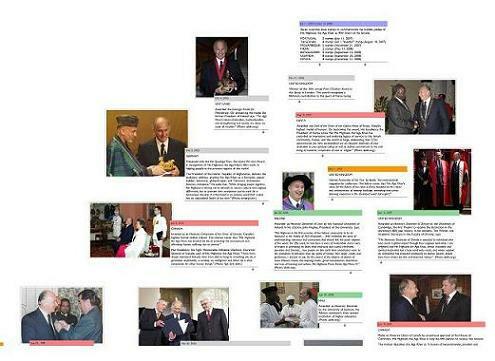 The timeline was inspired by another I created for the Aga Khan Development Network Kenya because not only does this visual format let us review the awards both chronologically and by type, it also lets us see at a glance the life time of honours as they unfolded, the sheer quantity of honours and the increasing pace at which Mawlana Hazar Imam is honoured; on average once every six months. However, I think the real value of the timeline lies in helping us understand what these honours represent and their significance. In his 2005 Jeune Afrique interview, Mawlana Hazar Imam made, what is to me, one of his most significant statements: “The ethics of Islam guide all my activity.” The depth of these few words are the foundation upon which all the awards have been accorded. In essence, the awards represent the world’s enthusiastic endorsement of the ethics and principles of Islam as interpreted and practiced by Mawlana Hazar Imam. One of these principles, Mawlana Hazar Imam has explained, is the Qur’an’s “affirmation of the primacy of the intellect” and when viewed from an intellectual dimension this endorsement is even more profound. The awards’ encompassing breadth – from the political to the theological, from the technical to the cultural and artistic, from social programmes to commercial enterprises, from patron of the destitute to patron of “the sport of kings” – this breadth is testament to the breadth of knowledge and depth of intellectual subtlety and elegance Mawlana Hazar Imam and the Imamat exhibit in every sphere of human endeavour. That this intellectual tour de force is inspired and driven by the ethics of Islam tangibly demonstrates one reason why Mawlana Hazar Imam characterizes Islam’s very strong links between faith and knowledge as “an extraordinary message for humanity“ (2007 L’Express interview). Besides helping us understand these facets, the timeline was also an attempt to create a definitive compilation of all the honours accorded him. This effort was complicated by the fact that all existing lists have errors and omissions, some subtle, others not so. For example, Mawlana Hazar Imam’s 1957 decoration, Brilliant Star of Zanzibar from His Majesty the Sultan of Zanzibar, is sometimes missing. Similarly it is often overlooked that in 1992 Mawlana Hazar Imam was not only made an Honorary Citizen of the City of Samarkand but also, according to the brief Ismaili Africa report of the function, presented with the Key to the City. And in 2008, it is unclear if Mawlana Hazar Imam was awarded a second Honorary Citizenship to Timbuktu; my reading of his speech concluded that he was awarded only one – in 2003. Thus, despite every effort to go back to original reports where possible, and despite an attempt to also identify every honour, no doubt some errors or omissions may remain and both Simerg and I welcome feedback. Note that some honours, though not usually cited as such, have also been included. For example, in the centuries long histories of both the Massachusetts Institute of Technology and Brown University, Mawlana Hazar Imam was the first Muslim invited to deliver the commencement addresses at both these prestigious institutions. Note also that awards to AKDN institutions, such as the 2006 Royal Toledo Foundation Award to the Aga Khan Trust for Culture, have been omitted; a compilation of all institutional awards would itself be a worthwhile project. An Honours graduate of Simon Fraser University in Computer Science and Mathematics, Mohib has been involved in the IT industry and software development since the 80’s. When the Aga Khan University Hospital and Medical College was under construction in Karachi, Pakistan, Mohib and his brother Zainul voluntarily assisted in evaluating and recommending the hospital’s information system (HIS) which was finally implemented as recommended. Mohib’s current project, MasterFile (http://www.masterfile.biz), is a state-of-the-art evidence system for academic researchers, investigators or litigators. A keen amateur astronomer for over 30 years, Mohib also enjoys kite flying and studying the relationship between faith and reason. At present he is assembling a comprehensive database of the His Highness the Aga Khan’s speeches and interviews. He has designed many mural scale timelines, one of which has been described as “[possibly] one of the best visual representations of complex data since Charles Joseph Minard prepared [in 1861] a graphic charting Napoleon’s march to Moscow.” During the Golden Jubilee celebrations of the Aga Khan in Kenya, Mohib was responsible for producing communication and exhibition materials for the Aga Khan Foundation (Kenya) and Aga Khan Development Network (Kenya) and the Ismaili community. Two PDF files are provided for you to download. 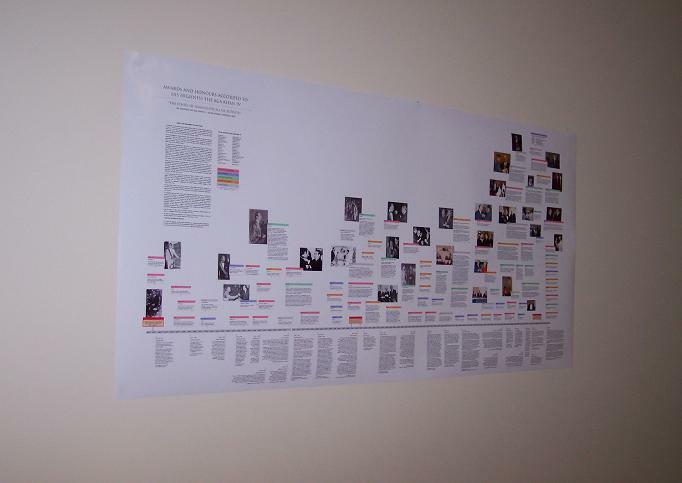 The first is a PDF file of the entire timeline chart. The print size, without resizing, will be approximately 78″ x 39″. (View it on your screen at 75%). 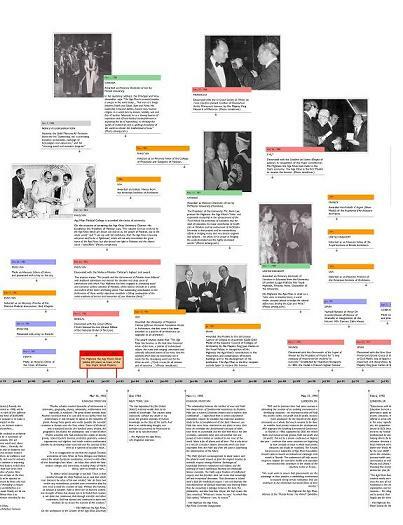 The second is a tiled PDF file which enables you to print portions of the timeline onto different page sizes, including A4, Legal, European, US tabloid etc. 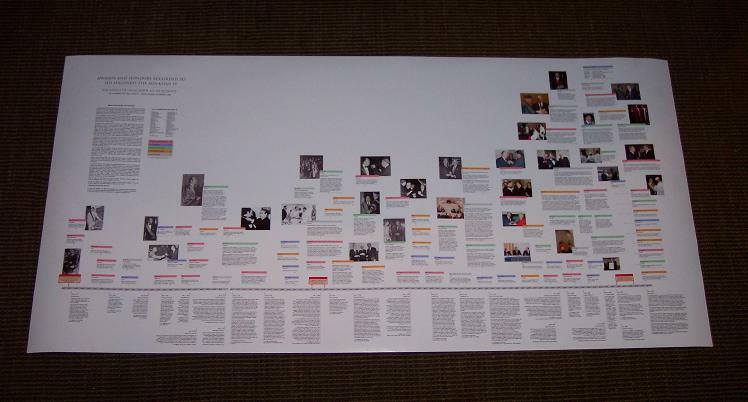 We are also making the timeline available in PNG format. The file is very large (4mb). Mr. Ebrahim has indicated that the timeline can be used freely for non-commercial use and if you’d like to display it publicly, please drop Mohib an e-mail (timelines [at] sent.com) with the venue where it’s displayed, city and country. He would also appreciate if you would kindly send him photos of the exhibit as he may start a gallery of exhibits. 3. If this is your first encounter with Simerg, we invite you to visit the Home page and find out more about this web site. Please also see the What’s New page for all articles posted on this website. This timeline can contribute significantly to inspire and educate people all around the world who value and believe in ethical principals of service to humanity without discrimination or bias to anyone anywhere. KHUDA KE BANDU SE PIYAR HOGA. There are countless people who profess their love for God by seving him . They could be found everywhere, even in jungles and deserts. I will slave myself to the one who has dedicated his life for the love of humanity. Congratulations Mohib, you have done a great job. Mohib has the skill and patience for which all readers including myself are deeply grateful. I just wanted to congratulate Mohib for his excellent work on this magnificant undertaking! The level of detail and accuracy is quite impressive. I am planning on laminating it and gifting to my parents and my uncle who love to collect such items and display it. It would look great in my study and give me some personal inspiration to strive toward making the world a better place in my own way. Well done, Mohib. Your passion converted to reality. Will be keen to follow other such timelines that you develop. Clearly significant amount of work that now conceptualizes in a friendly format the evolution of an exemplary leader. Oh wow, Mohib – and thanks! This is a prodigious labour of love by a man with a passion. Truly a fantastic contribution! Thank you Mohib for this remarkable timeline, and Simerg for publishing it. Excellent work. Thank you for sharing. Electronic format via PDF for printing purposes is really important. This is awesome work! Thank you for creating and bringing this online. It was on my to-do list but now I have it on a silver platter.